Celtic Leadwork is a specialist lead roofing contractor, with over 30 years of experience, and are overall winners of the Murdoch Sponsors Award 2016 and 2018 presented by the Lead Contractors Association. Restoration projects include high profile and historical buildings such as Windsor Castle, Downing street London, and Winchester Cathedral, including many historical manor houses and private listed properties. 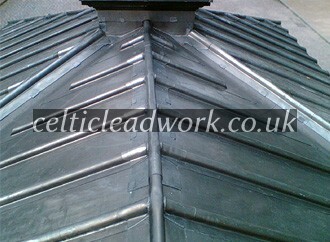 Celtic Leadwork are the first choice for all listed and period property restorations and repairs, using traditional roofing techniques with both milled and sand cast lead. We offer services on all aspects of lead work covering. Any of these items can be made bespoke, any design you wish with any names & dates of relevance, added. Ordered to your own requirements this means no one else would have these unique pieces any were in the world. Our other services also include Copper sheet roofing, Stainless steel roofing, Zinc roofing, and natural slate roofing. Why not combine your slate roof with traditional lead work to make a great and stylish finish to your property. As accredited members of the LCA (Lead contractors association) our lead roofs and craftsmanship can carry the 25 year guarantee. We work the correct detailing to the high standards according to LSA (lead sheet association) guidelines & practices. Celtic Leadwork primarily works in and around London including, Hertfordshire, Buckinghamshire and the Home Counties. Celtic Leadwork is also prepared to work throughout the UK and Europe, and we have also successfully completed a project in the USA.